Spring is here and I have enjoyed switching up my makeup routine recently. I like to move to tinted moisturizers and BB or CC creams in the spring/ summer seasons as they are lighter than the heavier foundations I use in the fall/ winter. I've been testing the Osmosis makeup line, which is available on Amazon luxury and really like it. Their mineral makeup is gluten and paraben free. I have particularly enjoyed using their CC cream, which blends and melts into the skin. It's great! I also love their highlighter, which I have been using on top of my cheek bones to give my skin a glowy look for spring. Here is more information on the makeup. The italicized words are the descriptions from Osmosis and my take follows. 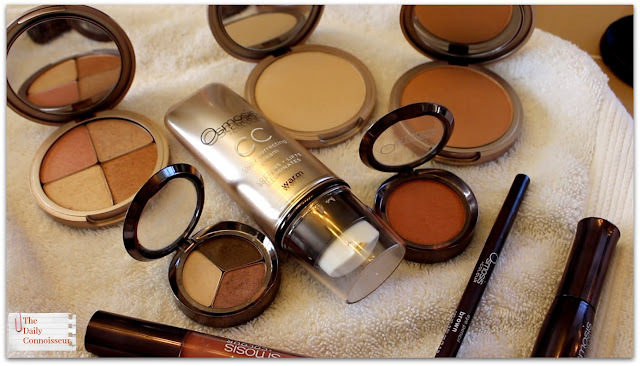 Osmosis cc cream in warm Osmosis Colour CC Cream helps you achieve a flawless look without caking on your makeup. UV filters help prevent sun damage while simultaneously diffusing discoloration. Its lightweight, creamy formula features natural color-correcting mineral pigments to even your complexion. 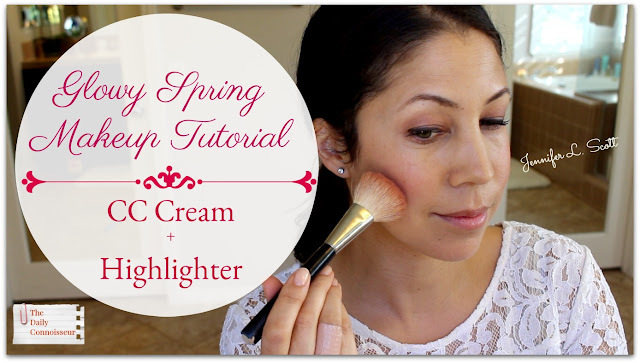 This CC cream is great and so easy to use. I find it to be very moisturizing. This gives very light coverage. I have linked my color from Amazon above, but you can also check out the whole range on Osmosis' website. translucent finishing powder Finishing Powder is a colorless mineral powder to set makeup and help ensure a flawless. Gluten and parabenFree, Talc-free and full of antioxidants for an all-natural approach to mineral makeup. This is a lovely mineral finishing powder. eye shadow trio in spice berry A compact trio of shimmering eye shadows for easy contouring of the eyes. I chose this to compliment my green eyes and I really like the colors. eye pencil in brown A creamy eye pencil that is quick-drying, smudge proof, and water resistant for beautiful long lasting wear. This Mechanical Eye Pencil glides on smooth with a bold color variety of colors. I like that this pencil is moisturizing and doesn't dry out. curling mascara in black Osmosis Curling Mascara utilizes a curved Cobra head brush to deliver a natural curl to the lashes. This mascara is great. I love the curling wand! I would love to see this in burgundy, however. bronzer in South Beach Osmosis Bronzer is perfect for contouring cheeks, nose, and eyes. Add bronzer to center of eyelid to bring out green, blue or light eye colors. Although I didn't do this in the video, I have been trying the bronzer on my eyelids and it looks great! A fun tip. highlighting quad Four luminous hues in one convenient palette to light up your complexion. Brilliant and lustrous with vitamin E and Moringa Seed Oil for nourishing benefits. Swirl a blend of all 4 shades or choose individual colors for different areas to provide a luminous glow. This is an excellent highlighter and I like that you have the option to use one color or blend combinations. It provides a very natural hue. TIP: Each shade of the palette may be used individually. blush in summer rose Osmosis Blush is a highly pigmented, all-natural Mineral Makeup offered in a wide range of colors. Gluten and paraben free. I love this pretty blush color and it lasts well on the cheeks. lip gloss in bare moderate shine Lip Gloss with a sheer tint of color to add a splash of life to the lips for a natural look. Gluten and paraben free. This shade provides a pretty peach color. 📍Thank you to everyone who has taken my new eCourse, How to be Efficient at Home. The weekends are a wonderful time to take this course. Some people devour the course in one day and some take their time with it. Either way, you can access the course at any time now or in the future. It's a wonderful resource and a great encouragement... especially in the comment section! 📍My ten-item wardrobe fashion show went live yesterday. I had fun shooting this video and including the whole family. Clearly we have a lot to learn from Ben's fierce runway skills! Thank you so much for 18,000 followers on Instagram! If you're not already following me there, I would love for you to join me. I hope you enjoyed today's video. I would love to know how you like to wear your makeup for spring. Do you use a highlighter? 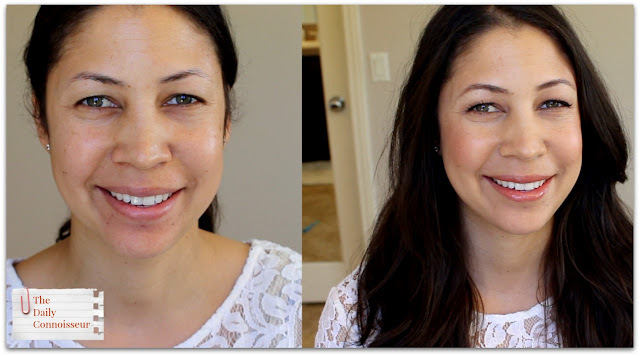 Do you lighten up your foundation by using a tinted moisturizer or cc cream? FTC: This post is not sponsored. The links to the makeup are affiliate. The makeup was sent for me to review and all opinions are my own and genuine.